Museum Lane runs between two of London's leading museums in South Kensington, namely the Science Museum to the north and the Natural History Museum (formerly the Geological Museum) to the south. It runs to the west off Exhibition Road through a gateway connecting the two museums and connects with Queen's Gate. Opposite on Exhibition Road is the Henry Cole Wing of the Victoria and Albert Museum. The Dana Centre is just to the north at the Queen's Gate end. 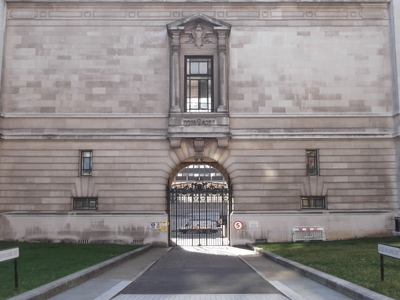 Museum Lane provides disabled access to the Natural History Museum. During the Exhibition Road Music Day there has been a Museum Lane stage as part of the festivities. The postcode is London SW7 and the lane is within the Royal Borough of Kensington and Chelsea. The nearest London Underground station is South Kensington Tube Station to the south along Exhibition Road. 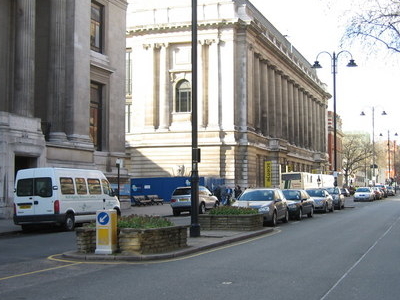 Here's the our members favorite photos of "Famous Streets near Kensington and Chelsea". Upload your photo of Museum Lane!